We had a great time this past Monday night at up/rooted.west, which met at our newest location, the back room of Caribou Coffee in Glen Ellyn. For those of you who couldn't be there I wanted to pass along this update, so that you can share in the experience despite your absence. The focus of our discussion was on how to practically live out principles of social justice in everyday life, and especially in our [mostly] suburban contexts. We began by brainstorming all the different kinds of issues that relate to "social justice", such as poverty, racism, fair trade, child labor, corporate exploitation, gender issues, care for Creation, etc. We talked about why these issues are of central important to Christians, and even to the message of the gospel itself. Some wondered whether our main purpose in focusing on these issues was so that we could win credibility to then share the gospel, though most agreed after some discussion that the message of the gospel was itself inseparable from compassion and justice for the poor and oppressed (cf. Luke 4:18-19). We talked about the need to be aware of macro-issues like fair trade and socially conscious consumption, while at the same time being willing to get our hands dirty in actually serving the needs of real people. We especially affirmed the importance of being with the poor in whatever ways possible, so that our calling to service and compassion will be able to just spring naturally out of our relationships with other people. We wrapped up our time talking about the vital importance of community in helping live according to our principles, and wondered how to go about creating these kind of intentional communities. We all agreed that living out social justice will only be successful if it's done out of a sense of joy and genuine love and not merely out of a feeling of guilt or obligation. If any of you have other recommendations please feel free to add them in the comments. Our next up/rooted.west gathering will be Monday, April 10th. 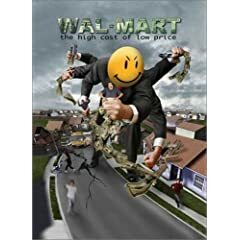 We decided to finish up our past few months of social justice related discussions by watching and discussing the documentary, Wal-Mart: The High Cost of Low Price. We will be meeting at Kristine Socall's home at 26w325 Torrey Pines Ct, Winfield at 6:30pm and starting the movie promptly at 7pm with discussion to follow. Come on out and bring some food or drink to share! You might be interested in adding the Another World is Possible series to your DVD list. It's co-directed by Shane Claiborne and featured in the back of The Irresistible Revolution. The website is awip.us or you can get there though thesimpleway.org -Best wishes on your learning journey.